Olaudah Equiano, b. 1745 (pseud. 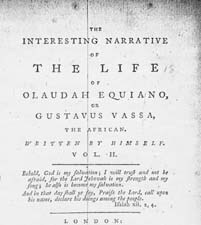 Gustavus Vassa) The Interesting Narrative of the Life of Olaudah Equiano, or Gustavus Vassa, the African. Written by Himself. Vol. II. Slavery -- History -- 18th century. Slaves -- Great Britain -- Biography.